Ready set . . . draw! I’ve learned the hard way that my pitmaster lifestyle and associated food choices don’t always result in my physician singing praises about my health status during my annual physical exam. We’ve all seen that look that Doc gives us and the advice we’ve heard before to eat less and move more (i.e., exercise). As part of our New Year resolutions for the 2014 barbecue season, Donna and I decided to work on the first of that two part equation. We would try to eat less and healthier by invoking Jedi mind tricks including brain washing ourselves to 1) eat slowly, 2) eat until we don’t feel hungry versus eating until we are full, and 3) make better food choices. After a quick check on the “fad” miracle diet ideas, we decided to try the Paleo Diet which was a program that Donna was part of at her workplace. I jumped on her bandwagon as a “sympathetic” accomplice so we could both get healthier together. Of course, as competitive pitmasters with Certified Barbecue Judge (CBJ) credentials from the Kansas City Barbecue Society (KCBS), we couldn’t resist applying our 9-9-9 judging skills to determine the best tasting food choices that the Paleo Diet required us to eat. Since Donna is a trained biotech scientist, she applied her training to gathering, analyzing, and reaching conclusions regarding some Paleo Diet recommendations such as beef burger patties and low-card hamburgers. Read on if you’re curious to find out what happened when we did a fast food burger crawl recently. A pitmaster’s life isn’t an easy one. Eventually, all that eating catches up to you. Harry and I found ourselves on a Paleo Diet at the beginning of the year. The removal of carbohydrates, dairy, extra sugars and processed foods felt great. But is also taught us a few lessons. A vacation in Santa Barbara forced us to make a few hard food choices we wouldn’t normally make. We arrived late at our hotel and found nothing to be open except for the local In-N-Out Burger. We had no choice. 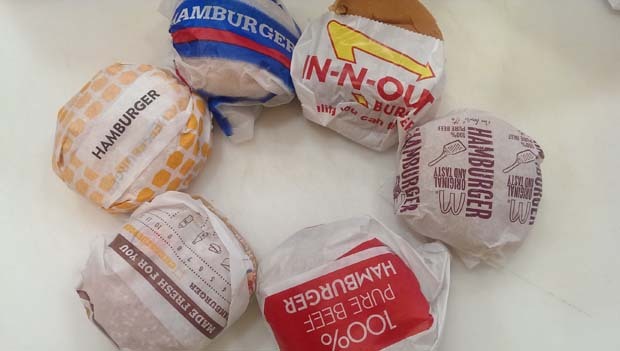 We ate at In-N-Out and ordered low-carb hamburgers. This is a hamburger without a bun or cheese and wrapped in lettuce. The experience made me realize that the quality of the beef patty was rather low. It tasted like cardboard. That begged the question: are all beef patties really this bad? We tested out our theory. We asked, of the major fast food chains, who had the best beef patty and whom, if any, had the best low-carb a.k.a. lettuce-wrapped burger. My sights were set pretty low. I wasn’t expecting a whole lot. And I removed any memory of a delectable Umami Burger Restaurant patty from my mind. Off we went, driving up and down the main drag of Diamond Bar, California. We went to Jack in the Box, Carl’s Jr., In-N-Out, Wendy’s, Burger King, and McDonald’s. Del Taco had a burger too but after an hour of driving around, we wanted to go home with our igloo full of cheap eats. We ordered a hamburger from each and tried our best to order a lettuce wrapped burger. To our pleasant surprise, with the exception of Burger King, no one flinched at our unusual request. I guess this was Southern California after all. The other surprise was the difference in the cost of a burger. 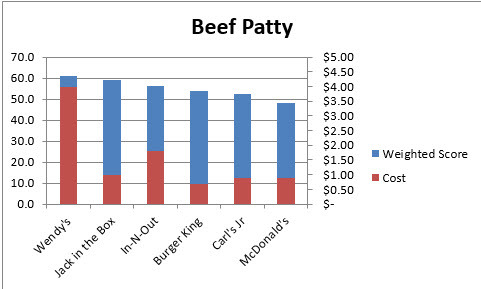 The cheapest hamburger was Burger King at $0.69. The most expensive hamburger was Wendy’s who charged a whopping $3.99 for a hamburger, more than twice the price of their competitors. 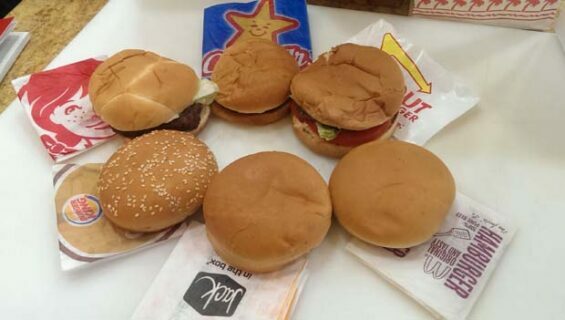 When we came home, we pulled the patties out of the buns and understood why Wendy’s charged so much. Their patties are considerably larger than the others. Harry and I judged the patties according to traditional BBQ standards of appearance, taste and texture and applied the KCBS weighted scoring to each category. In this scoring method, taste weighs most heavily and appearance is least important. 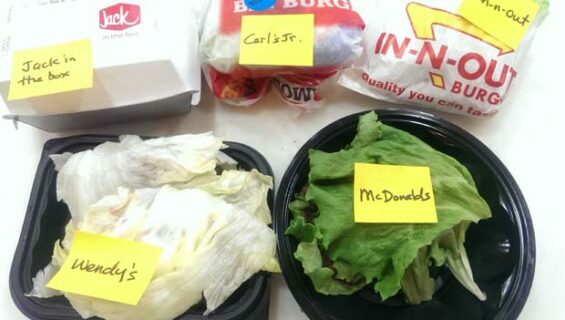 We did the same thing with the lettuce wrapped burgers and then gave each joint a cumulative score. 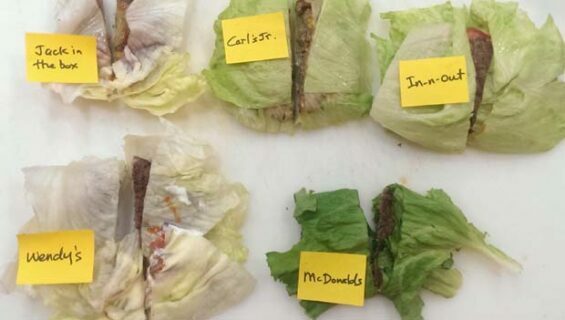 Five low-carb lettuce wrap hamburgers ready for shoot out! If you’re wondering who had the best tasting beef patty. It was Jack in the Box. It was incredibly well seasoned. Wendy’s had the best texture and to us, Burger King had the best looking patty. It was probably the grill marks. 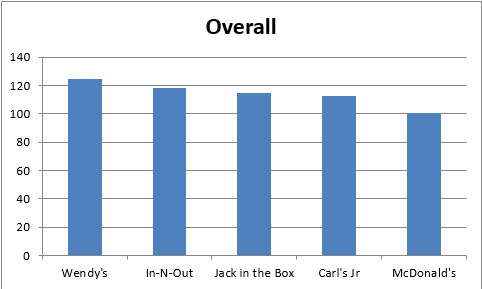 Once you weigh all of the factors together, Wendy’s was the winner by a hair over Jack in the Box. But dollar for dollar, the difference in cost was staggering. The Jack in the Box burger was only 1/3 the price of a standard Wendy’s hamburger. 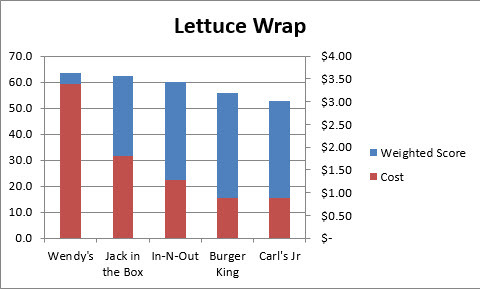 For the lettuce wrap burgers, Wendy also came out on top, again edging out Jack in the Box for the second time. Generally, lower cost correlated with lower quality and experience. Harry likes the crispy white stem portion of the lettuce and I like the soft leafy green portion. The lettuce wrapped burgers that had pickles, mayo, mustard, and ketchup got favorable thumbs up from me. Those without condiments were bland and a disappointment. 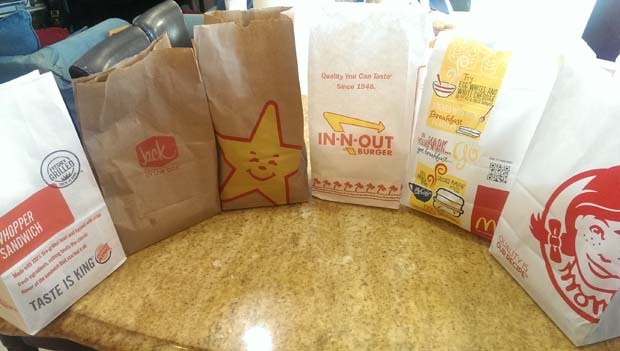 Of the six joints in our burger crawl, our top three favorite fast food burger places were Wendy’s, In-N-Out and Jack in the Box. 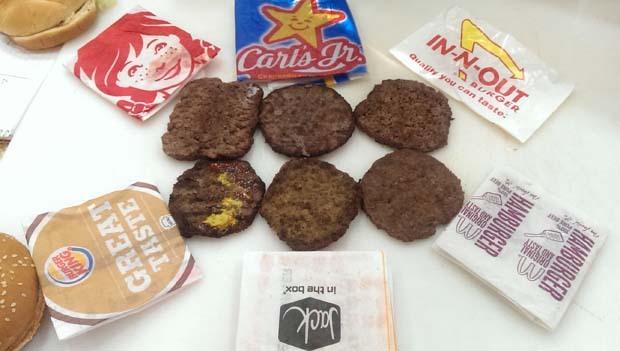 Next time you’re chowing down at a fast food joint, if you dare, stop and think, what does the beef patty, by itself, really taste like?